According to some people the Intergovernmental Panel on Climate Change (IPCC) is a marvelous organization – so marvelous it should be regarded as a prototype. A month ago, therefore, the UN General Assembly formally created the Intergovernmental Platform on Biodiversity and Ecosystem Services. …in many ways mirror the Intergovernmental Panel on Climate Change (IPCC) which has assisted in catalyzing worldwide understanding and governmental action on global warming. There’s just one problem. The IPCC model is utterly dysfunctional. It is a screeching, flashing, billboard-sized example of influence without accountability. For proof of this statement, one need look no further than the IPCC’s chairman, Rajendra Pachauri. The editorial board of the London Times thinks Pachauri should resign. It says he “presided over the use of dodgy science” in the IPCC’s 2007 report, that he ignored legitimate criticism when it first emerged, and that he has let us all down. In its zeal to persuade the world of the catastrophic consequences of man-made global warming, the IPCC has lost both its objectivity and the trust of the public. That is one of the main reasons why we… believe that Rajendra Pachauri, the IPCC’s chairman, should step down. This issue is far too important for there to be a scintilla of doubt about the reliability of the reports and raw data on which policy must be based. While Dr Pachauri remains in post, those doubts will remain. Mistakes will always be made but it’s how you handle those mistakes which affects the credibility of the institution. Pachauri should have put his hand up and said ‘we made a mistake’. It’s in these situations that your character and judgment is tested. Do you make the right judgment call? He clearly didn’t. Last year, a committee appointed by the InterAcademy Council (a group of science bodies from around the world), spent four months investigating the IPCC. It considered the views of hundreds of individuals. I’ve devoted an entire blog post to those who commented on Pachauri via a questionnaire. The short version is that many IPCC insiders also see his leadership as a problem. …12-year appointment (two terms) is too long for a field as dynamic and contested as climate change. 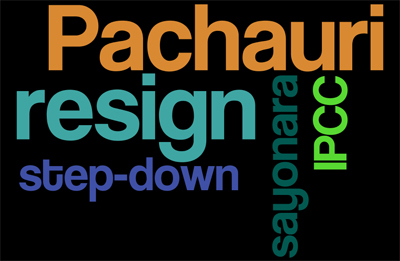 Pachauri has been chairman of the IPCC since 2002. That’s nine long years. Given all of the above, why has he not done the honourable thing and fallen on his sword? Why has he not acknowledged that his continued presence is harming the cause he claims to believe in so passionately? What is more important – restoring the IPCC’s reputation or the vanity of a 70-year-old man who’d prefer to remain in the limelight until 2014? When an organization is functioning properly these sorts of situations are not permitted to fester. When scandals erupt on their watch, when the press starts calling for their heads, cabinet ministers resign. This is what we expect in democracies. This is what accountability looks like. …there was a fear that targeting Pachauri could provoke a confrontation between the IPCC’s rich and poor member countries. There it is in a nutshell. The IPCC’s leadership will not be held to a high standard because, at the end of the day, the IPCC is merely one consideration among many in an international poker game. And some people think it’s a good idea to replicate this model. This entry was posted on January 28, 2011 by Donna Laframboise in climate bible, Greenpeace, IPCC, Rajendra Pachauri and tagged climate bible, Greenpeace, InterAcademy Council, Intergovernmental Panel on Climate Change, Intergovernmental Platform on Biodiversity and Ecosystem Services (IPBES), IPCC, John Sauven, Rajendra Pachauri.